My very first first daytime activity after arriving in Taipei was an ascension to Taipei 101’s observatories. It boasts indoor observation decks on the 88th and 89th floors, and an outdoor observation platform on the 91st floor. That outdoor observatory encircles the building at an altitude of 1,285 feet — the second-highest alfresco viewing platform of any skyscraper in the world. Taipei 101, viewed from street level. 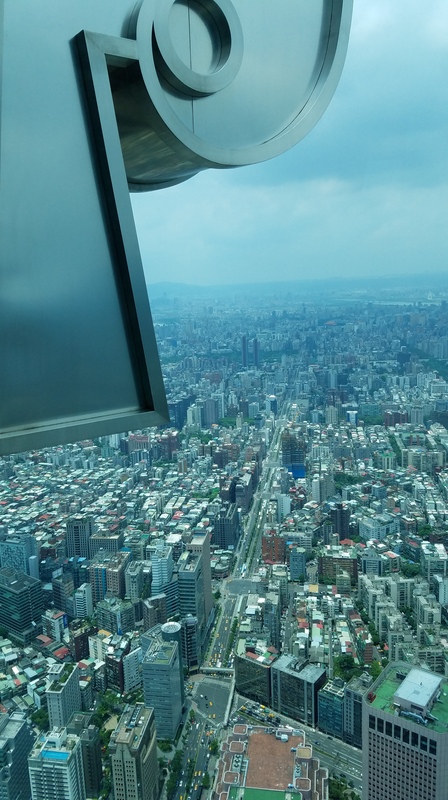 A view from the observatory atop Taipei 101. 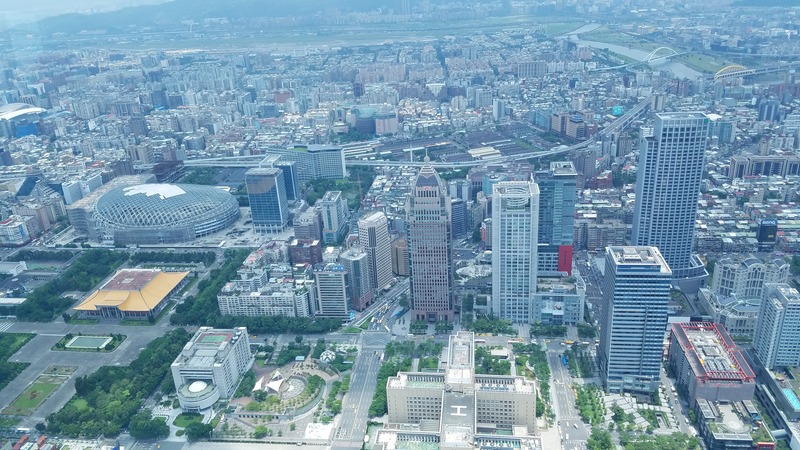 Another aerial vista from the observation deck of Taipei 101. By the way, who says engineering can’t be fun? The TMD in Taipei 101 even has its own mascot, named “Damper Baby.” And bonus: that mascot, of which there are four versions with differing colour schemes, was designed by Sanrio — the same Japanese company that brought Hello Kitty to the world! (Speaking of Hello Kitty, you haven’t heard the last of her in this blog post. 🙂 ) Damper Baby has taken on a life of its own; it stars in a comic book, and figurines of the various versions of the mascot are popular souvenirs. 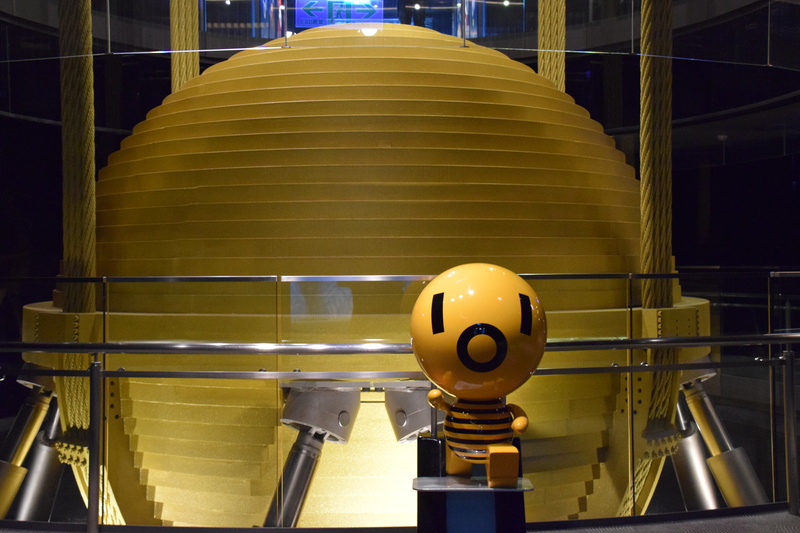 Putting a damper on things: this is Taipei 101’s tuned mass damper, with its mascot, the “Damper Baby,” in front of it. 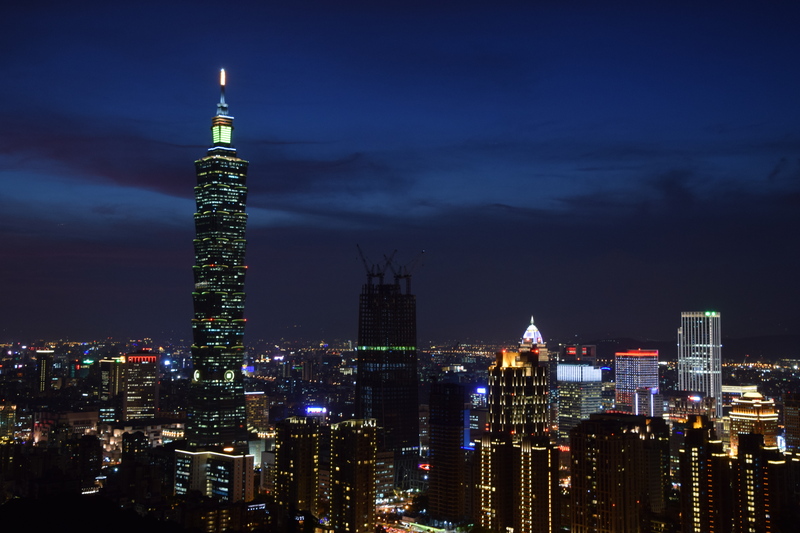 In my opinion, as is the case with many skyscrapers, the views of Taipei 101 that you can behold from various points in the city are far superior to the views from its observation deck. 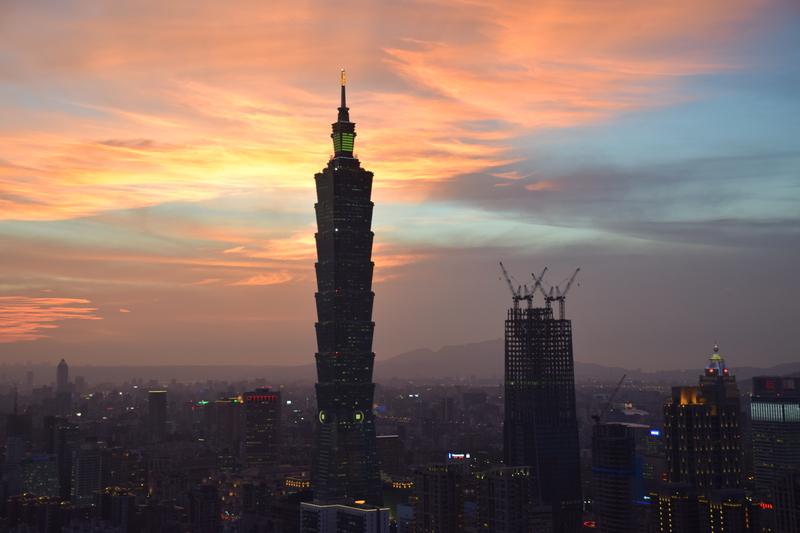 Let’s turn now to a place where I went to seek out breathtaking views of Taipei 101. 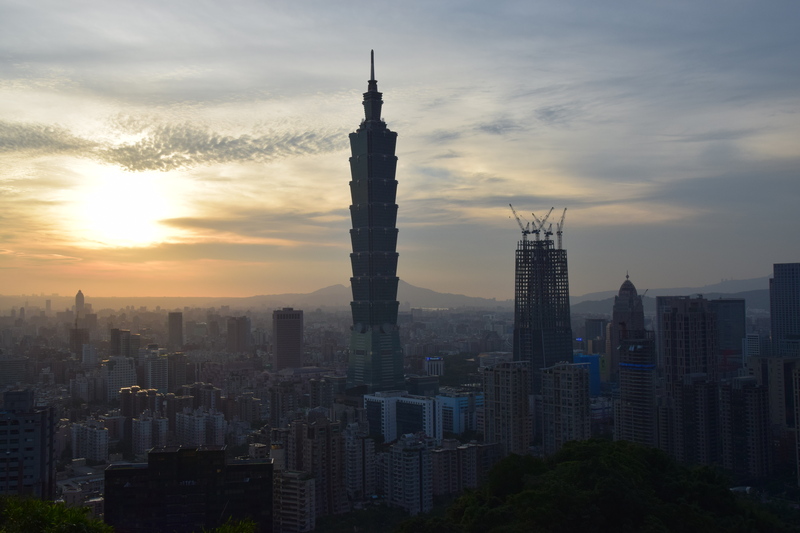 When I asked the concierge staff at my hotel to direct me to the best vantage point for gazing upon Taipei 101 against the backdrop of the surrounding skyline, they directed me to a hill called Elephant Mountain. 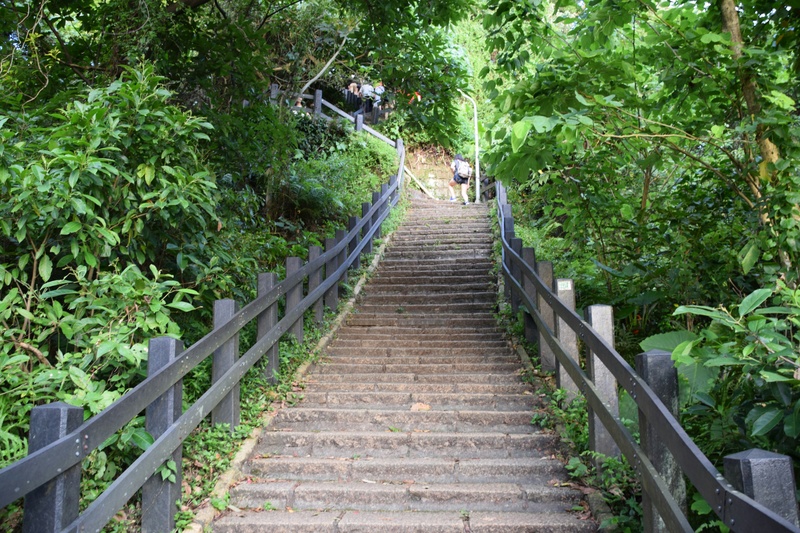 To reach the viewing areas upon that hill requires ascending a series of staircases that are quite steep at times. Naturally, I was intent on reaching the very highest of the scenic overlooks, despite the forbidding slopes of the stairways. 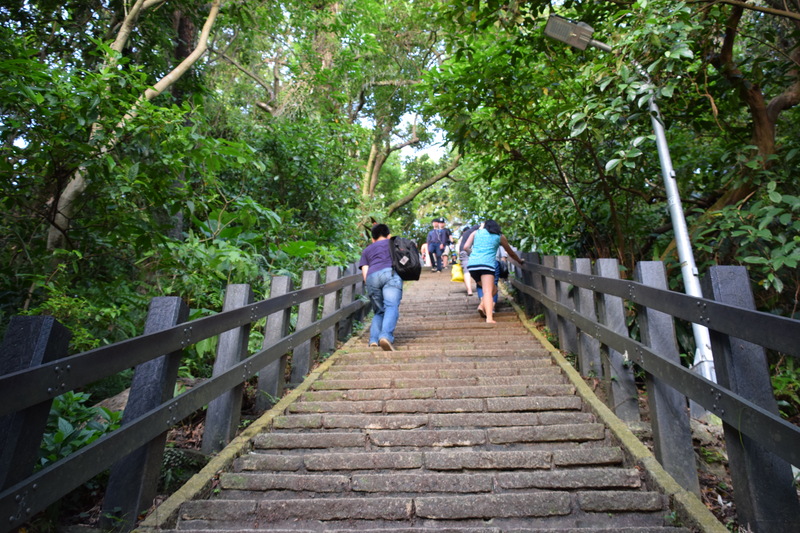 Part of my steep climb up Elephant Mountain. Note also that earlier during the day on which I summited Elephant Mountain, the temperature in Taipei had soared to a sweltering 101.7 degrees Fahrenheit — with high levels of humidity. At the time when I commenced my hike up the hill, at about 6:00 pm, it was still quite hot and muggy in the city. So a climb that would have been challenging under any circumstances was even more physically demanding than it would normally have been. But I carried two bottles of water with me; and although my supply of H2O added considerable weight to my daypack, I managed to remain hydrated and avoided succumbing to hazards such as heatstroke. The sun sinks towards the horizon. The sky explodes with colour as nighttime approaches. As sunset yields to dusk. Night has fallen over the city. A brief and probably oversimplified summary of the relevant history: in 1912 a revolution overthrew the Qing dynasty (also known as the Manchu dynasty), the last imperial dynasty of China. Following that revolution, mainland China was known as the Republic of China from 1912 through 1949; and it was governed by a party called the Kuomintang (KMT). 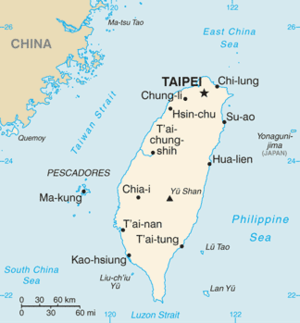 In 1945, the Republic of China annexed Taiwan, which had been a colony of Japan for the previous 50 years. In 1949, the Communist party led by Mao Zedong took over mainland China, renaming it the People’s Republic of China (PRC). 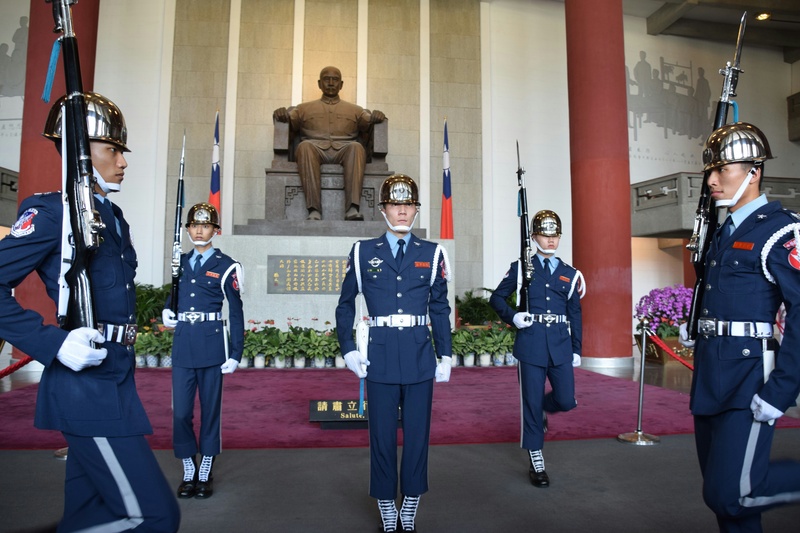 For several more decades, the KMT continued to hold sway over Taiwan (which retained the name of the Republic of China), ruling it as a one-party state as under martial law. 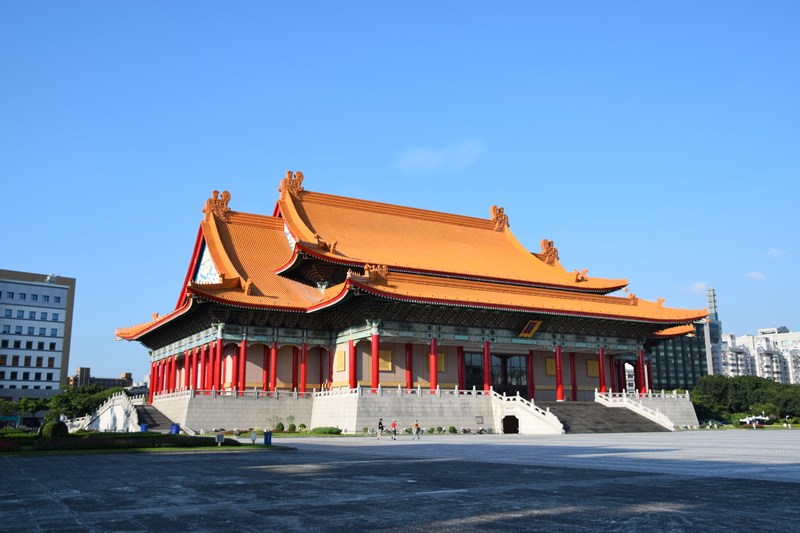 However, in the late 1980s the KMT permitted additional political parties in Taiwan, and beginning in 1996, Taiwan has held democratic Presidential elections. 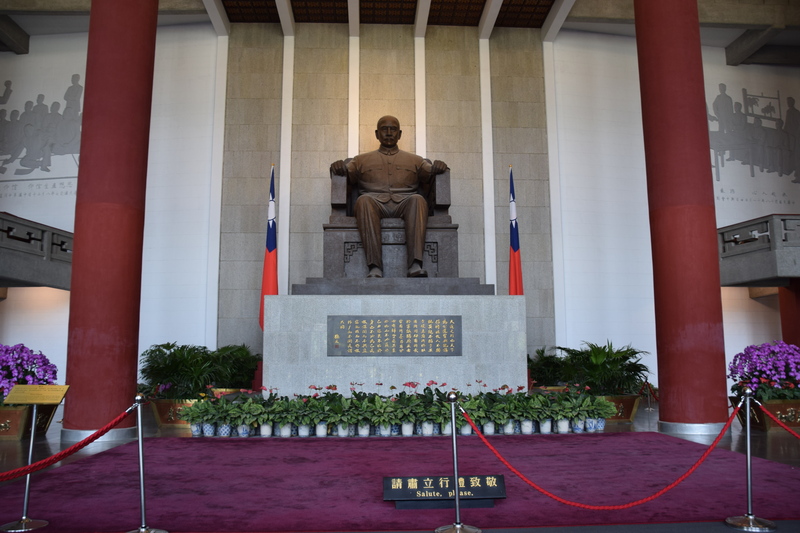 Today, the KMT is one of several major political parties in Taiwan. 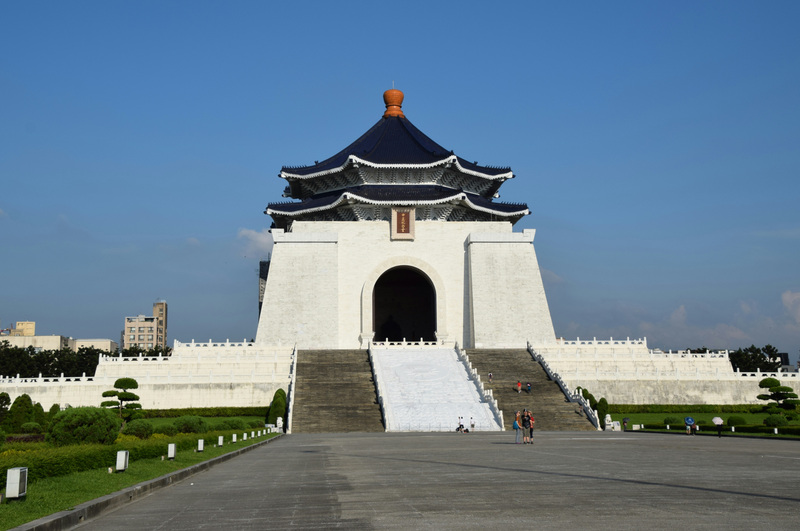 National monuments erected in Taipei in recent decades pay tribute to a pair of individuals who played prominent roles in both mainland China and Taiwan in the 20th century. During most of the period from 1928 to 1975, the Republic of China was led by Chiang Kai-shek (CKS), who in that capacity held several different titles. He was also a long-time Director-General of the KMT. 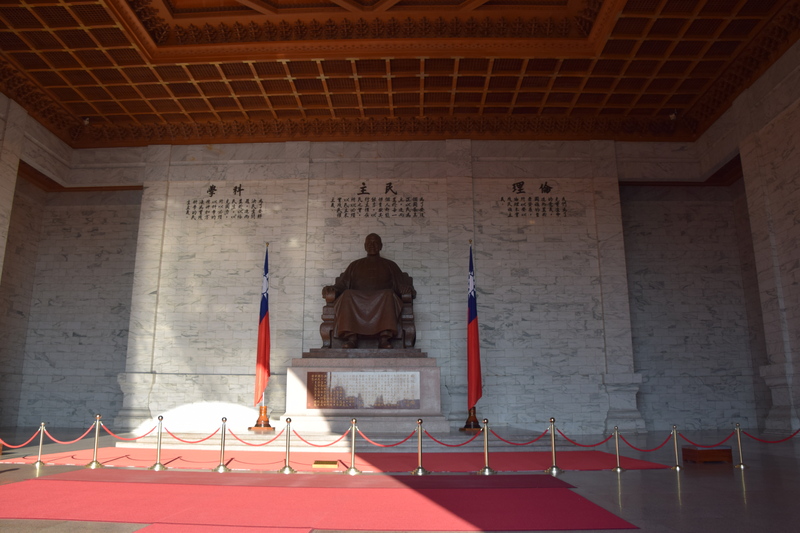 CKS is honoured in Taipei with an eponymous National Chiang Kai-Shek Memorial Hall, which contains a bronze statue of him seated in a chair. 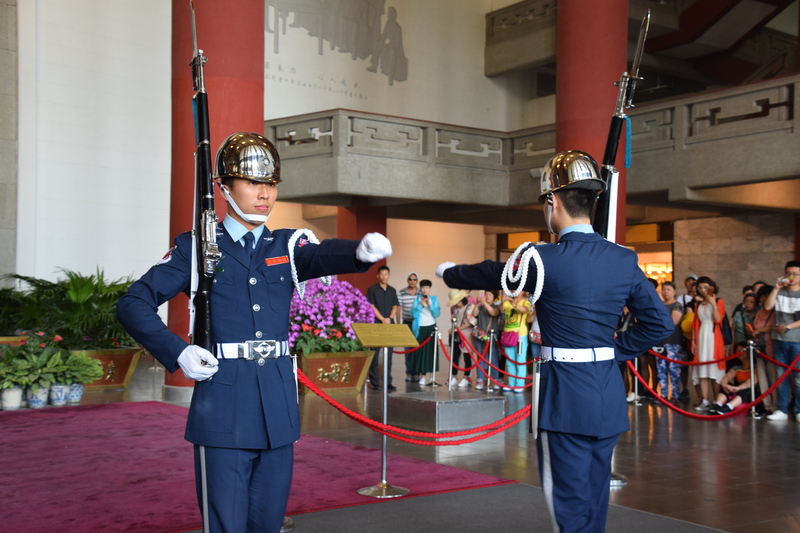 Soldiers stand sentinel in front of the statue, and a changing of the guard occurs hourly. 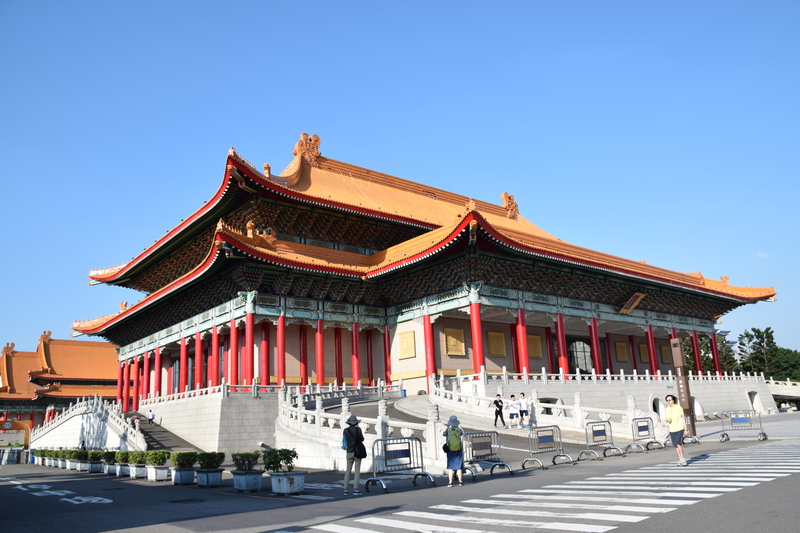 The Memorial Hall, completed in 1980, is part of a cultural complex that also includes the National Theater and National Concert Hall. The gate at the entrance to the complex that houses the National Chiang Kai-shek Memorial Hall. The National Theater, with part of the National Concert Hall visible behind it. 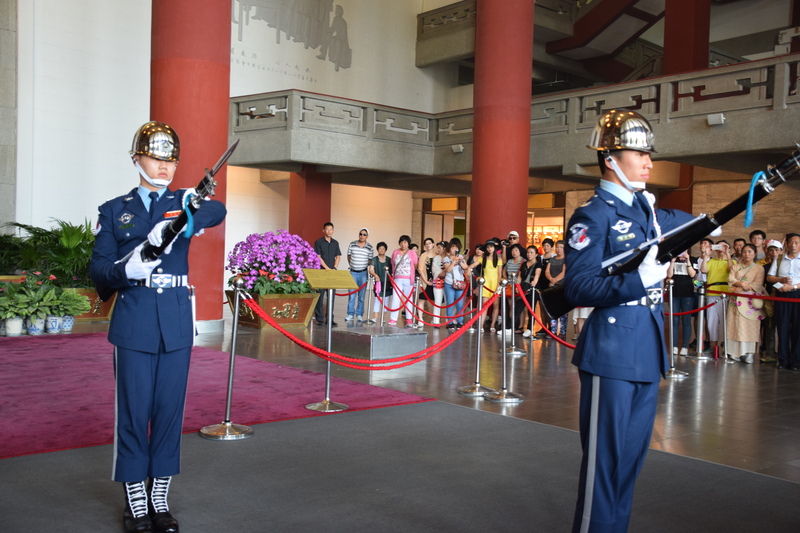 The following video that I created shows excerpts from the changing of the guard ceremony in CKS’s memorial hall. 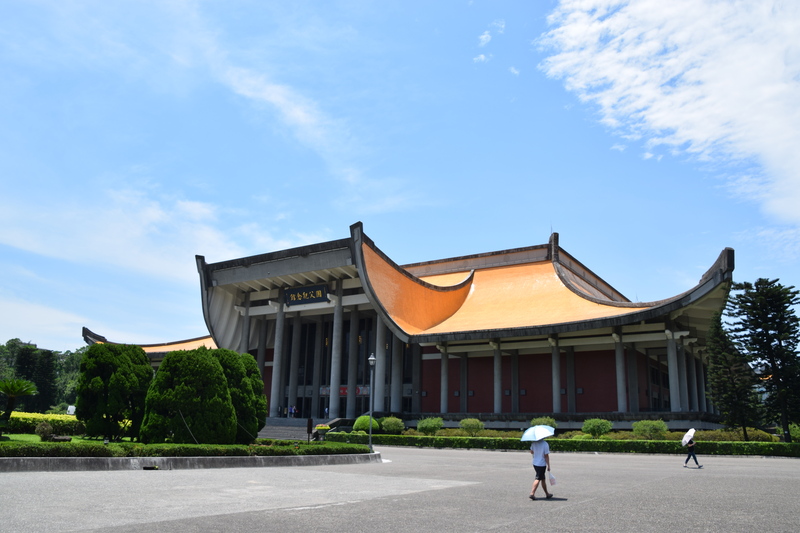 SYS’s memorial hall was completed in 1972. Like the corresponding one for CKS, its focal point is a bronze statue of its namesake in a seated pose. The exterior of Sun Yat-sen Memorial Hall. A scene towards the beginning of the changing of the guard. Another scene from the changing of the guard. One more scene from the changing of the guard. Yet another scene from the changing of the guard. Surrounding the Sun Yat-sen Memorial Hall are several gardens. 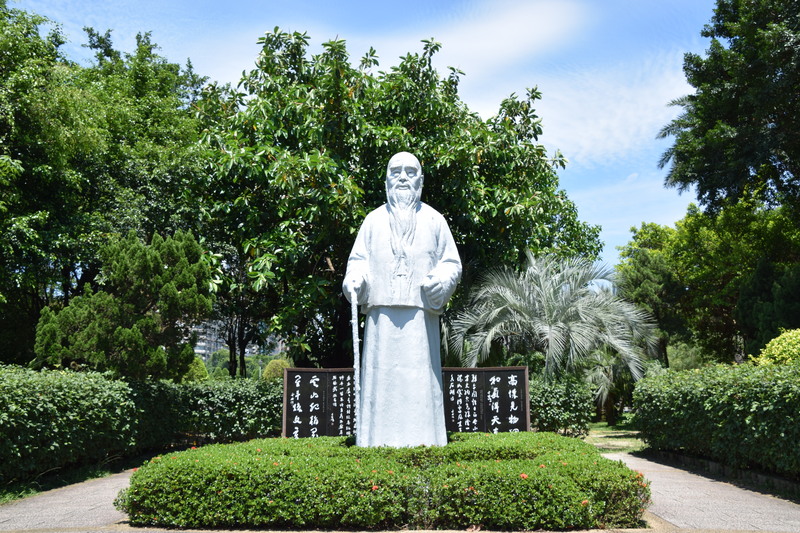 In one of them is a statue of Yu Youren, an educator who played a role in the revolution that led to the formation of the Republic of China in 1912. Dr. Youren was also a master calligrapher. In the gardens surrounding the Sun Yat-sen Memorial is this statue of Yu Youren. 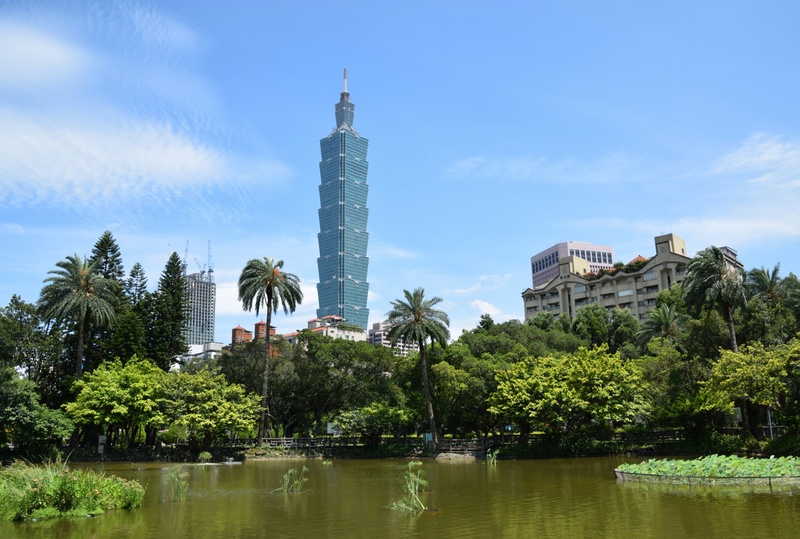 There’s also a picturesque Chinese-style garden, featuring a pond with nice views of Taipei 101. The Chinese gardens and pond nearby to the Sun Yat-sen Memorial. Although Hello Kitty originated in Japan, the whimsical, semi-anthropomorphized white feline is quite popular in Taiwan. 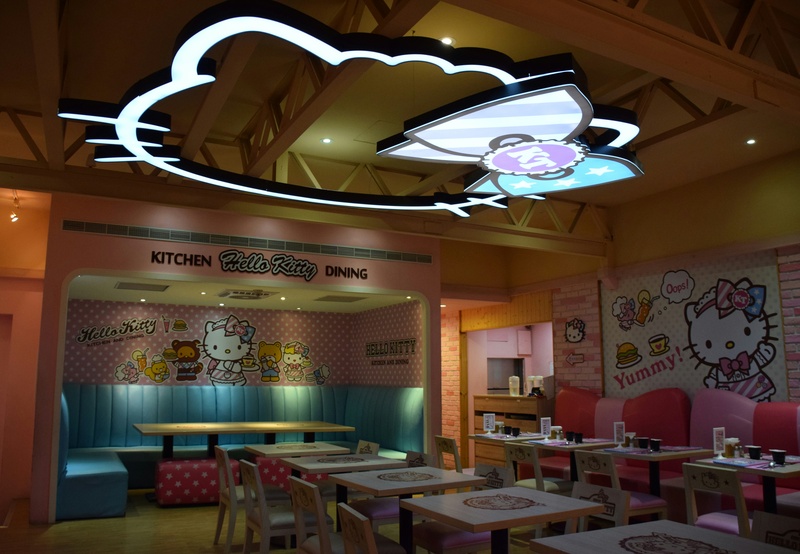 For example, in the town of Kaohsiung, a hotel offers the option of lodging in a guestroom decorated with a Hello Kitty theme. 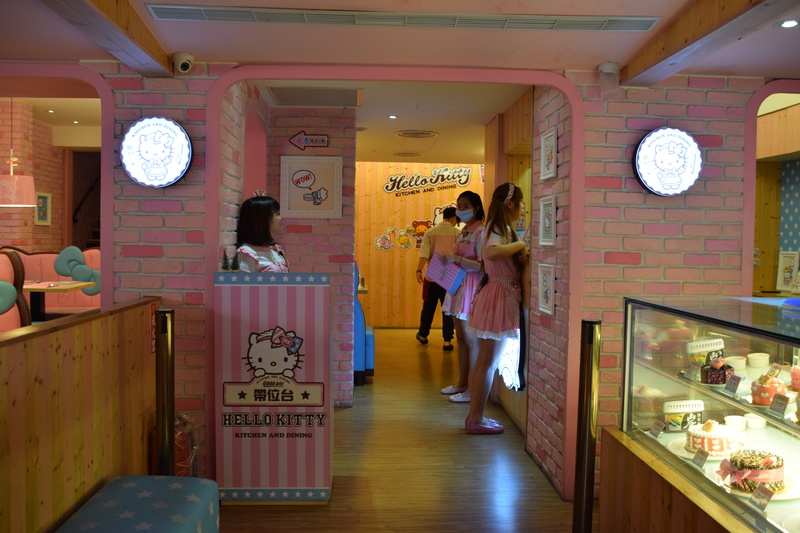 I didn’t make it to Kaohsiung, which is about 185 miles southwest of Taipei as the crow flies; but I received ample exposure to Hello Kitty in Taipei. 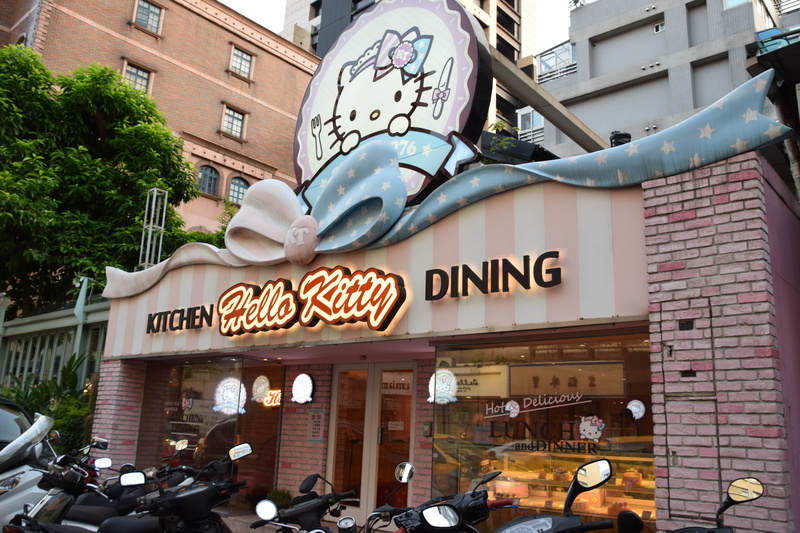 The exterior of Hello Kitty Kitchen and Dining. The entrance to this fine dining establishment. I especially enjoyed the decor in the upstairs dining room. When it came time to order, I actually chose my entree based on which picture in the menu featured the most items that looked like Hello Kitty. 🙂 That turned out to be some dish involving pork. 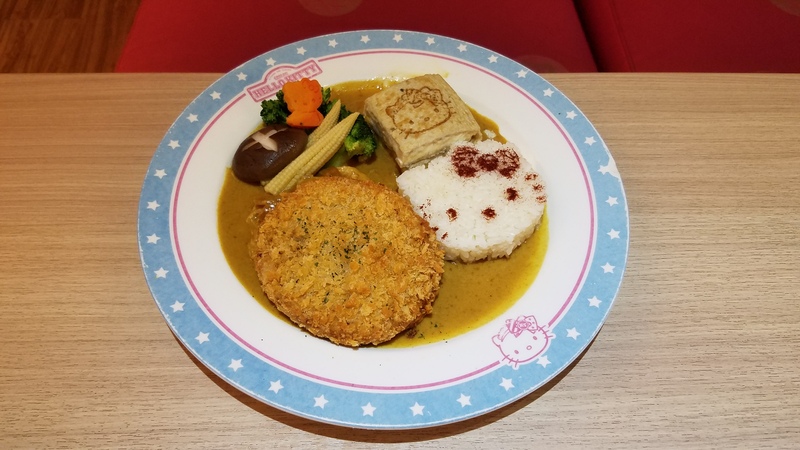 Presentation is everything with the menu items at Hello Kitty Kitchen and Dining. This is the chocolate smoothie that I selected as my beverage. 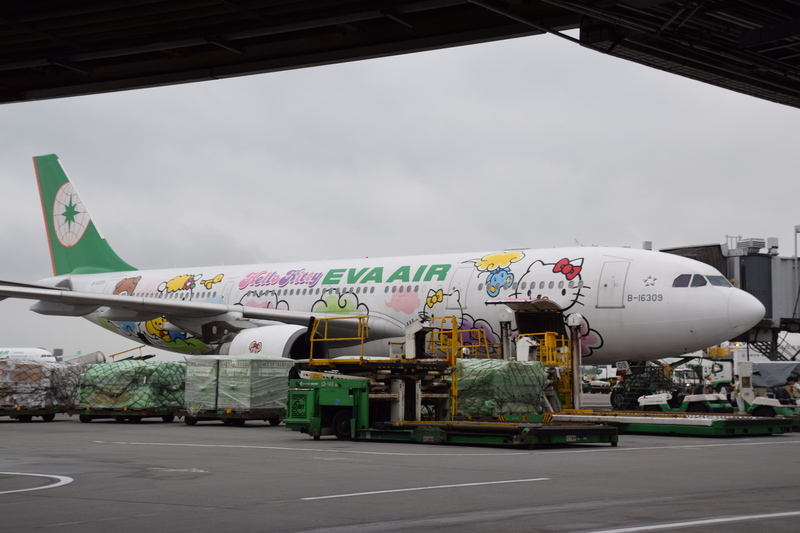 An EVA Air Hello Kitty jet at Taoyuan International Airport. 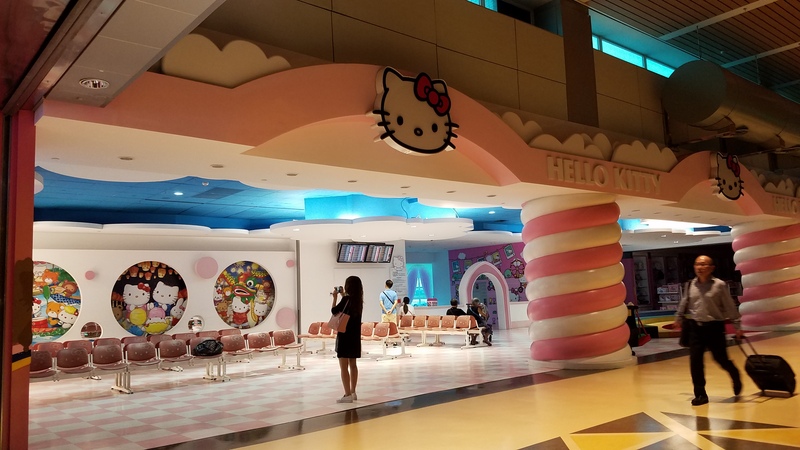 The airport itself features a Hello Kitty-themed self-service check-in area for EVA Air, and even a waiting lounge replete with Hello Kitty imagery. A cluster of check-in kiosks for EVA Air. A very cheery waiting lounge. 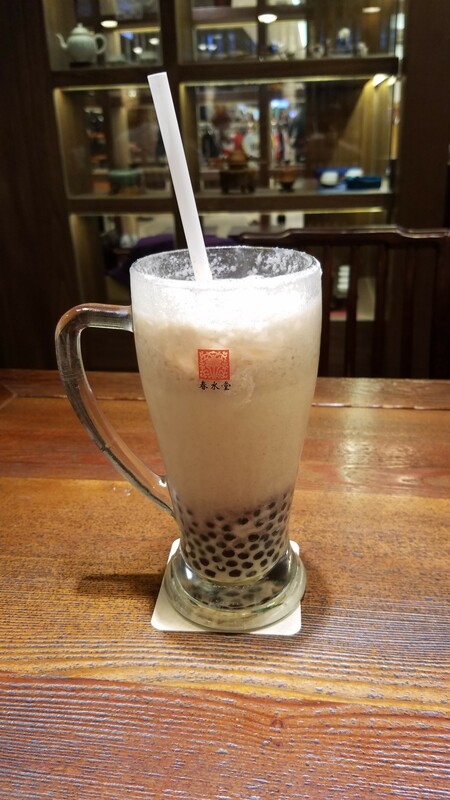 The glass of bubble tea that I enjoyed in Taipei. Now that I’m back in New York, I feel grateful that I can always find bubble tea here when I have a craving for it. One of the pleasures in many Asian cities is strolling a night market — a permanent setup that typically covers several square blocks and consists of stalls offering street food, lined on either side by more permanent restaurants as well as various shops. The streets that house night markets are usually pedestrian-only, with the exception of the occasional motorcycle that zips through them; so one must be aware and alert when ambling along those streets on foot. 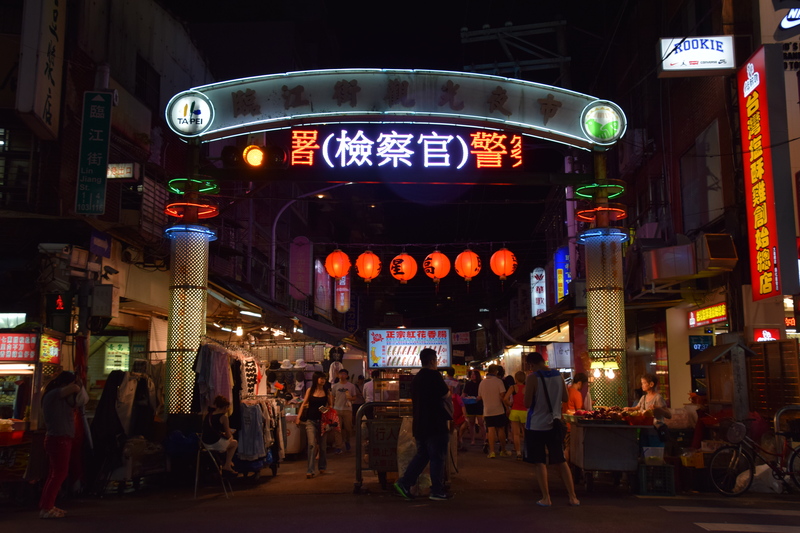 Taipei boasts a plethora of these night markets; this site enumerates an astonishing 31 of them, which provides an indication of how embedded these after-dark emporiums are in Taiwan’s culture. I strolled through one called Tonghua, which was nearby to my hotel. 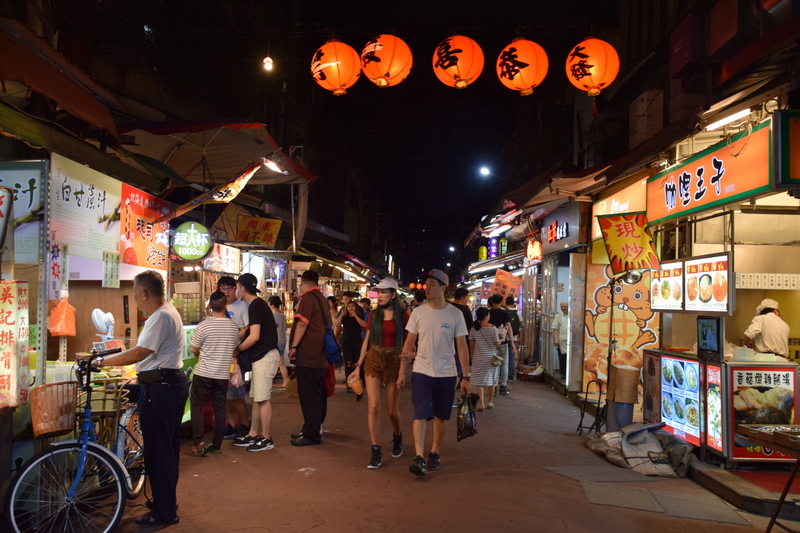 If I get back to Taipei, I would like to try one or more of its other night markets, such as Shilin (the largest, which dates all the way back to 1899) or Raohe (also one of the oldest). In the meantime, I can share with you what Tonghua was like. The gate at one of the entrances to the Tonghua night market. My favourite single item that I consumed at the Tonghua night market was a cup of sugar cane juice. 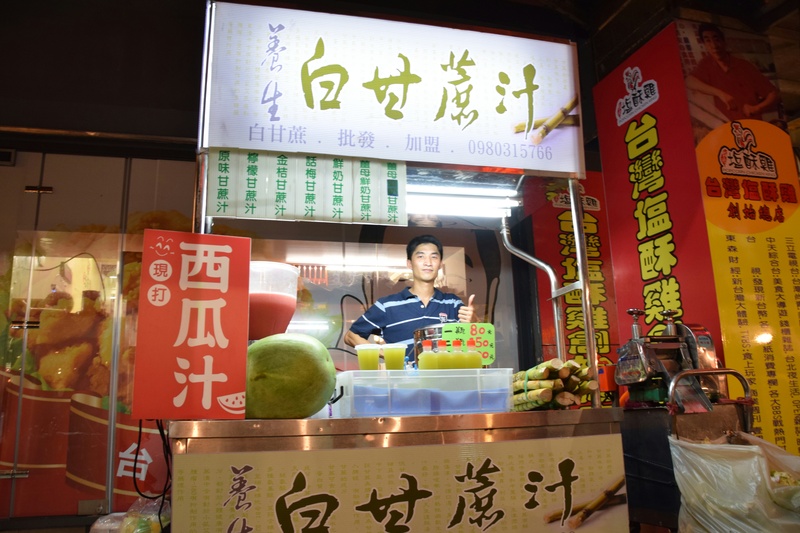 The booth at the Tonghua night market where I purchased a cup of sugar cane juice. 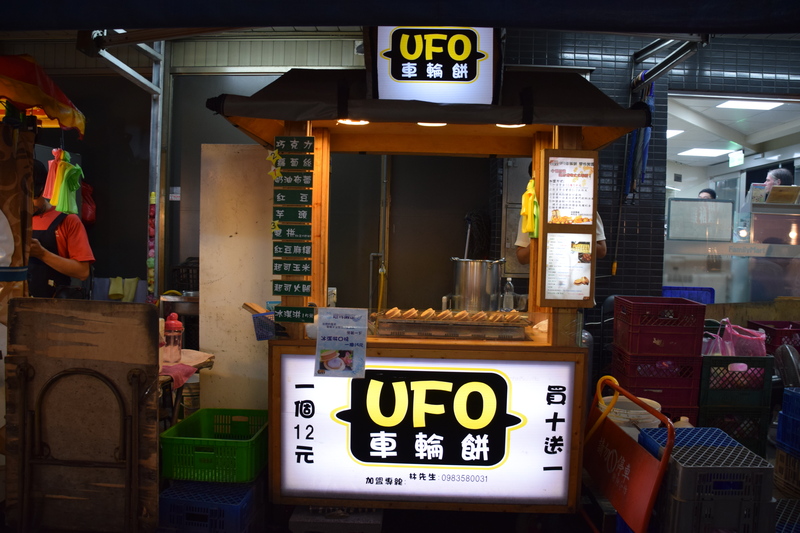 I’m not sure what unidentified objects this particular food stall was selling . 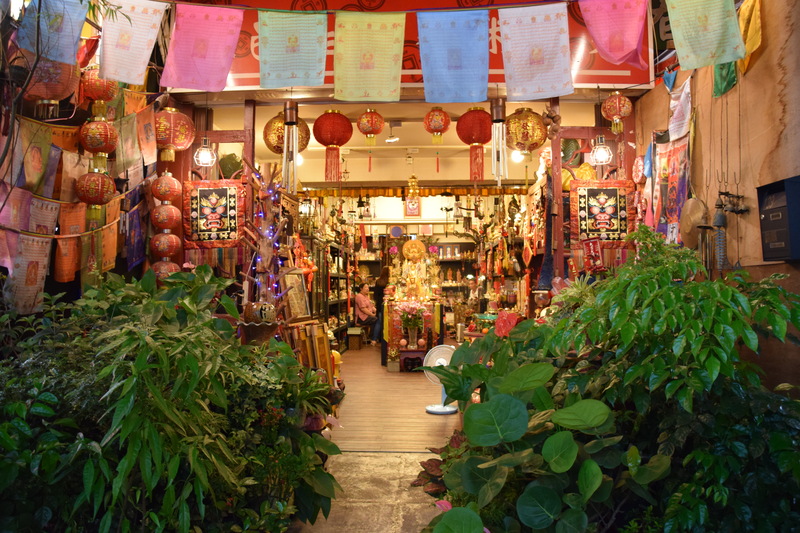 . .
A colourful store on the side of one of the roads that traverse the night market. 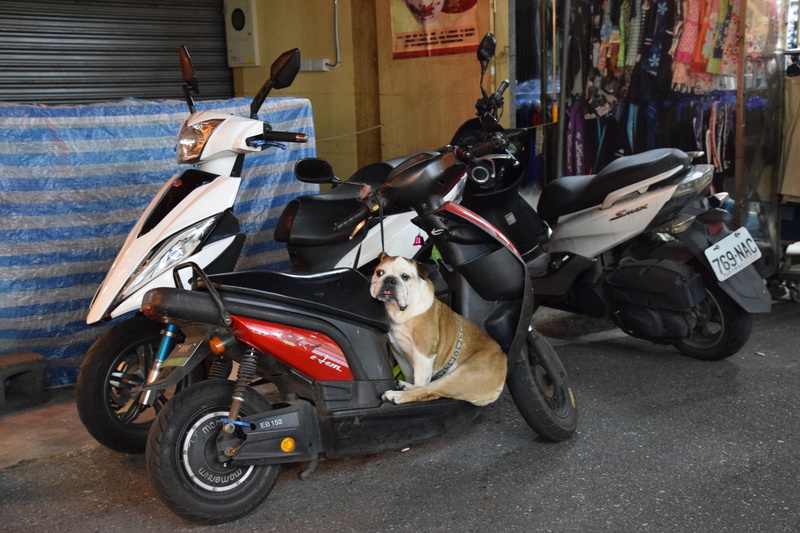 A dog guards its human companion’s motorcycle while said human roams the night market. Another scene from the night market. Departing from Taipei’s airport: hey, who turned out the lights? 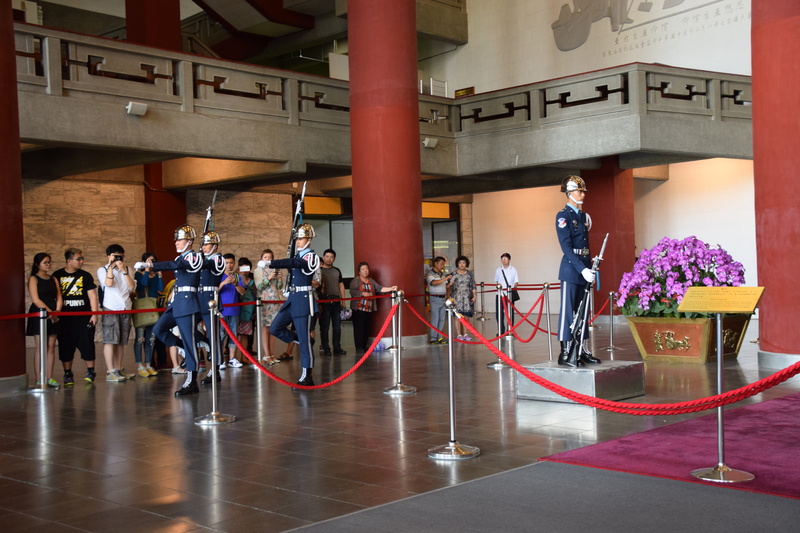 On Thursday, June 2 I was scheduled to depart from Taipei’s Taoyuan International Airport for a flight to Beijing — from where, just two days later, I’d be proceeding to North Korea. On the morning of June 2, after the torrid, record-setting temperatures of the previous day, severe thunderstorms cooled off Taipei. One of those storms knocked out the power in a portion of one of the terminals of the airport — specifically, the terminal at which my flight to Beijing would be boarding. There was no shopping to be done in the airport terminal. The lack of juice also contributed to delays of numerous flights at the airport — including mine. When I reached my gate, I was told that although my plane was present and ready to take on passengers, it couldn’t be boarded because the door to the jetway could only be opened electronically; and it was not possible to manually override that system to unlock the door. Without entering the jetway, it wasn’t possible for anyone to access the plane. Thus it was that, for the first time in my travelling career, I experienced a flight delay caused by a power failure. From there, things only got worse. Even when the jetway was finally unlocked, the crew hadn’t yet arrived at the airport; the morning storm had caused flooding that led to massive traffic jams near the airport. Then, shortly after the crew showed up, the airline’s gate staff announced that our flight would be moved to a new gate, because a different flight needed the gate that we were currently occupying. Why we had to move, and why the other plane couldn’t be the one re-assigned to a different gate, is a mystery that was never explained. We were actually relocated to a group of four gates adjacent to each other — and all of which already had other airplanes parked at them. Which meant that my plane had to park on the tarmac, and it would be a long time before there would be an opening for it to pull up to one of the gates. Then, further exacerbating the situation, the gate agents lost contact with the flight crew of my plane. Needless to say, a plane can’t be flown without a flight crew. 🙂 Additional delay ensued. 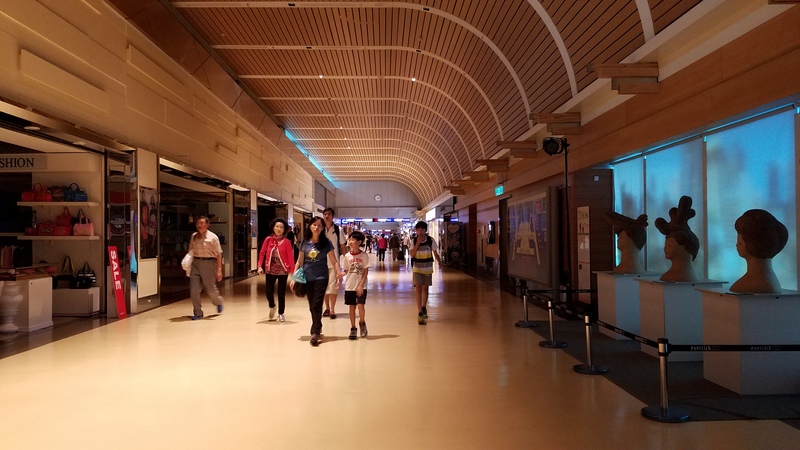 Keep in mind that due to the partial loss of electricity, the air conditioning in the terminal was inoperative — and that while the morning thunderstorm had cooled things off considerably, the temperatures in Taipei had been furnace-like just a day earlier. The end result: in both of the gate areas in which I’d been waiting out my flight delay, there was a lot of sweating going on. Eventually my plane’s flight crew was located; and buses were sent to ferry my fellow passengers and me to our aircraft, which was still out on the tarmac. By the time all of this had concluded and the full roster of passengers was seated aboard the aircraft, it was far later than our original departure time. We started taxiing approximately four-and-one-half hours after the scheduled departure time of my flight — making China Airlines flight 517 the most delayed airline flight I’ve ever experienced. It’s a new personal record! While the schedule had called for us to arrive at Beijing Capital International Airport at 6:50 p.m., we actually landed after 11:00 p.m.
And my troubles still weren’t over. After a fairly long period of standing at the baggage carousel in Beijing, I learned that China Airlines had forgotten to load my suitcase — or the luggage of any of the other passengers on my flight — onto the plane. As a result of this mind-boggling oversight, everyone’s luggage was stranded in Taipei. I filled out a form in the baggage claim office, and was promised that my baggage would fly to Beijing the next morning and be delivered to my Beijing hotel in the afternoon. The next day, as morning turned to afternoon and my luggage failed to turn up at my hotel, I grew increasingly nervous. Because now my departure for the next country on my itinerary — North Korea, which is not exactly known as a shopper’s paradise — was less than 24 hours away. As it happened, my hotel in Beijing was next door to a shopping mall. If necessary, I could go on a shopping spree to that mall in the evening, and purchase several days’ worth of clothing as well as a replacement suitcase in which to transport that clothing. Then I might have to fight with the airline for reimbursement of the expenses incurred in making such purchases. 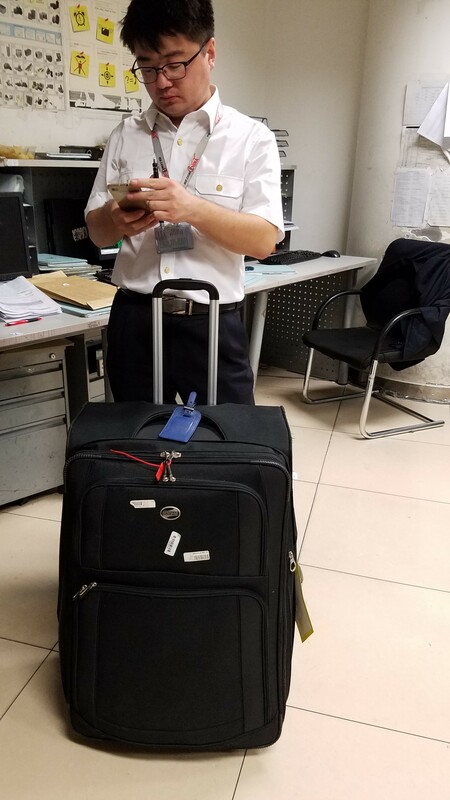 Miraculously, at about 6:30 pm, the on-duty concierge managed to make telephonic contact with a human being at the Beijing Capital International Airport baggage claim office. However, there came a time during that phone convo when the baggage claim agent, after indicating that my suitcase had arrived in Beijing, placed the concierge on hold to look into its status and location. After being on hold for a while, the concierge inexplicably hung up. Predictably, when he redialed the number for the claims office, he was unable to get through again; nor did that office call him back. At that point, I decided to take matters into my own hands, jumping in a taxi to the airport. After the rare experience of going backwards through customs to reach the baggage carousel area, I marched into the baggage claim office. A person inside led me to a different office — and wouldn’t you know it, my suitcase (which was supposed to have been delivered to my hotel hours earlier) was still there! Well, at least my worrying was over and I’d been reunited with my possessions. And I would have stuff to wear in North Korea. After going to the airport myself to get it, I was finally reunited with my luggage. Overall, Taipei exerted quite a hold on me. I just wish it hadn’t been so hesitant to let me — or my luggage — go. 🙂 I enjoyed the city, though, and I hope for the opportunity to spend more time there and experience even more of its charms. 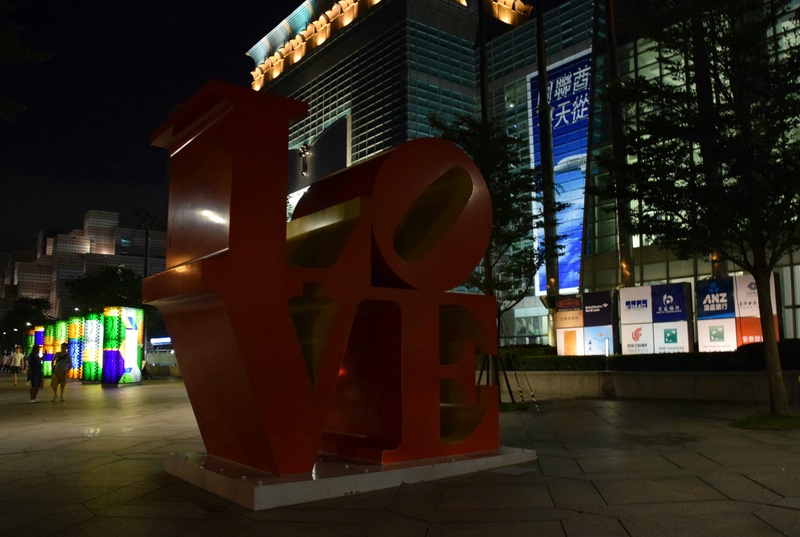 This Robert Indiana “LOVE” sculpture — one of numerous identical sculptures in various cities around the world — is installed next to the base of Taipei 101. I’ve seen others in New York, Philadelphia, Montreal, and Tokyo. 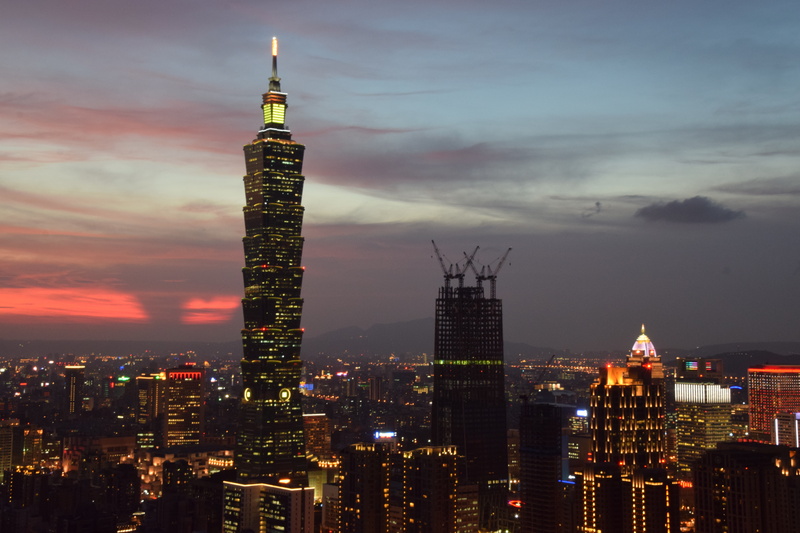 Would you like to visit Taipei? @Julius: Ever since Taipei 101 was built I’ve been a fan, but seeing it in person made me truly appreciate it. It’s possibly the most unique-looking of all the supertall skyscrapers (although the Petronas Towers in Kuala Lumpur are also quite distinctive, as is the somewhat shorter Burj Al Arab in Dubai). Taipei 101 is also a lot of fun to go inside. I am so glad you got your luggage back after all that! (extra kudos for being so proactive, as most of us would have considered it gone forever) The Taipei 101 is impressive, being from Canada, most of our “skyscrapers” are those little guys it looks down on. Great post! One thing that I think makes Taipei 101 even more impressive is that it’s so much taller than anything else in the city. It’s literally more than twice as high as any other building in Taipei. So it totally dominates the skyline in a way that’s not true of many other cities’ highest skyscrapers. Congrats on your 41st karaoke country! 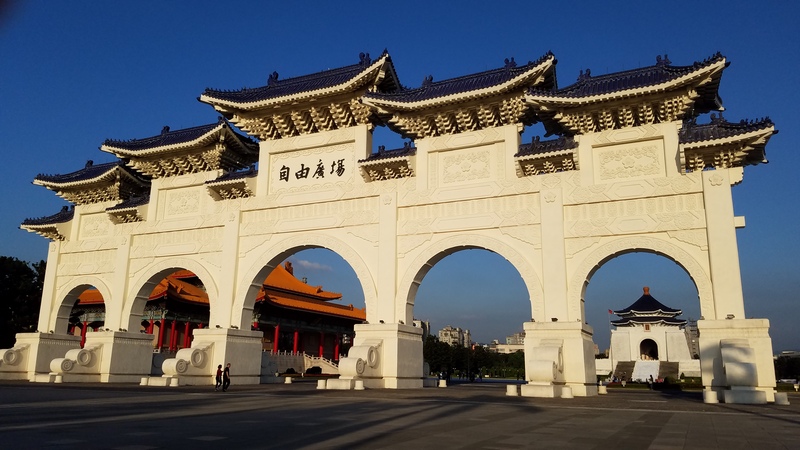 We’ve wanted to go to Taiwan for a while as our friend lives there, but this blog post has convinced us we must go there!! 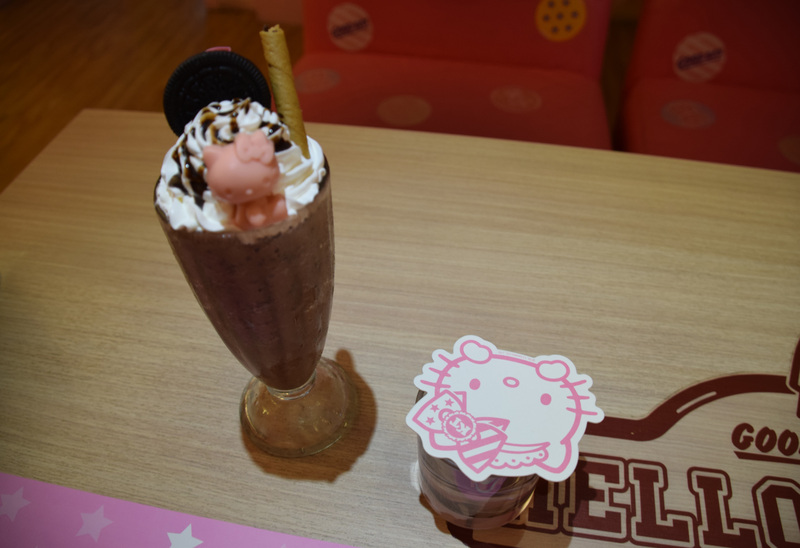 Love that hello kitty cafe! I’ve been to Taiwan nine times and I think it’s one of the most underrated countries. It’s clean, modern, friendly, not very expensive, and has great food. 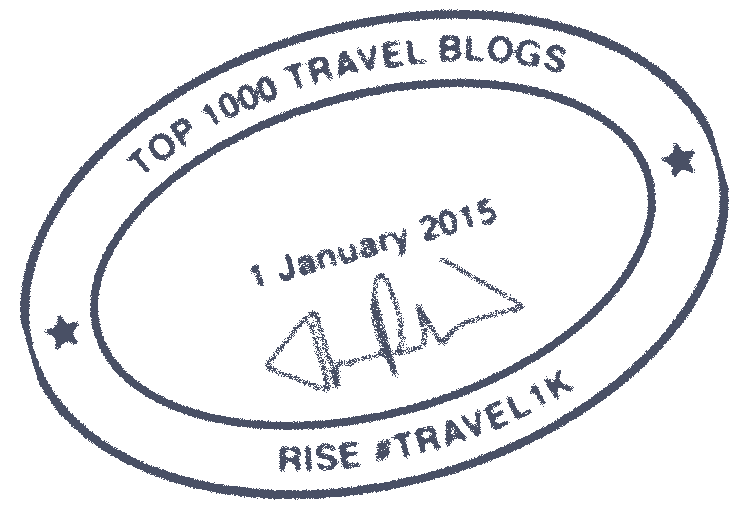 And congrats for successfuly tackling the geopolitics of the place in your post. @Tom: Wow, nine times! I’m impressed. I agree that Taiwan is underrated. Often when people are visiting mainland China they don’t even consider adding nearby areas like Taiwan — and when they do, they’re more likely to consider Hong Kong (which admittedly is a beautiful city). Thanks for the compliment on my treatment of Taiwan’s geopolitics. 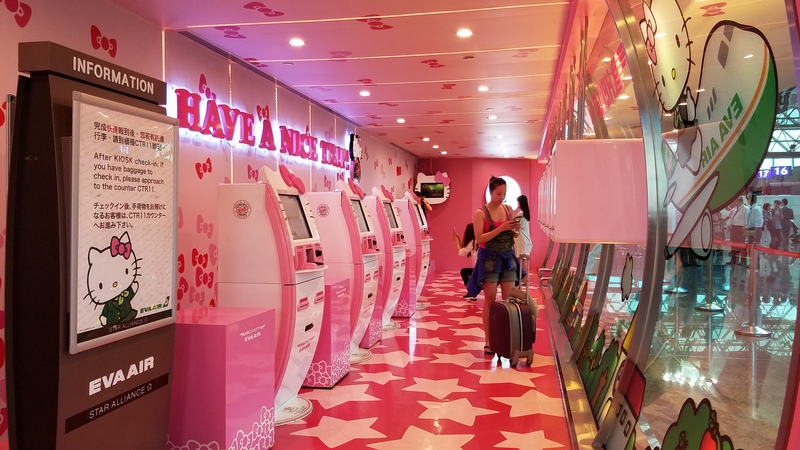 I’d better not show this post to my son’s girlfriend or she will be booking the next flight to Taiwan just to visit the Hello Kitty Cafe! 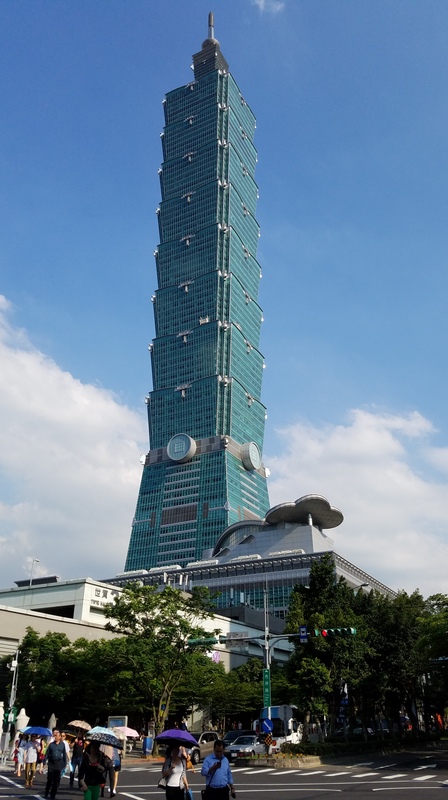 ha i’ve heard so many crazy stories from friends about taipei 101. i definitely want to check it out next time i’m in taiwan! Stunning aerial photos, especially the ones from Elephant Mountain! Looks an an incredible experience in Taipei! The Hello Kitty obsession is still going strong I see! travelled asia as a kid, have to say i haven’t felt a strong desire to go back to re-discover the cities to see how they have changed. great captures of taipei and looks like you had a great stay.. food isn’t half bad.. but i have to say, i’m not really into the whole sanrio obsession that asia has.. i didn’t understand it back then and even less so now.